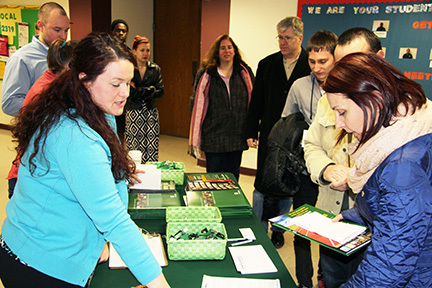 WEST WINDSOR – More than 100 prospective students, parents and family members attended a Feb. 27 American Honors information session at Mercer County Community College (MCCC) to learn more about how high-achieving area high school students could receive an affordable, quality education with opportunities to transfer to some of the top four-year institutions in the nation. "I want to transfer to a four-year school and this would give me a good start, and a chance to save some money," said Jacob Lesniak, a senior at Steinert High School and an NJSTARS scholar. Anna Lesniak, Jacob’s mother, said the program appealed to her because it would allow her son to stay close to home for the first two years of his college education, in addition to the ease of transfer to a four-year institution. More than 100 prospective students, their parents, and family attended a recent information session on American Honors at Mercer, an intensive academic program that prepares students to transfer to some of the nations top four-year universities. "My son definitely wants to get a bachelor’s degree, and this will help him transfer and meet his goals," she said. American Honors at Mercer launches this Fall. The program is a partnership between MCCC and Quad Learning, Inc., a Washington, D.C.-based company that is working with MCCC faculty to further enrich the Mercer curriculum and provide intensive student advising and additional online resources. American Honors advisors will work closely with students to help them achieve their goals for transfer. American Honors has developed transfer partnerships with more than 35 selective colleges; graduates have been accepted at Georgetown, Cornell, Stanford Vanderbilt and USC, among other top colleges. Dr. Donald Generals, MCCC’s Vice President for Academic Affairs and Dean for American Honors, said there has been a great deal of interest in American Honors among graduating high school seniors, and the strong turn-out at the information session is an indication of the demand for an intensive academic experience. "There are a lot of parents here – that’s a very good sign," Generals said.